Spring is coming earlier to parts of the Arctic, and so are some migratory birds. But researchers have yet to get a clear picture of how climate change is transforming tundra life. That’s starting to change as automated tools for tracking birds and other animals in remote places come online, giving researchers an earful of clues about how wildlife is adapting to hotter temperatures and more erratic weather. In a new study in Science Advances, researchers at Columbia University describe a way to quickly sift through thousands of hours of field recordings to estimate when songbirds reached their breeding grounds on Alaska’s North Slope. They trained an algorithm on a subset of the data to pick out bird song from wind, trucks and other noise, and estimate, from the amount of time the birds spent singing and calling each day, when they had arrived en masse. The researchers also turned the algorithm loose on their data with no training to see if it could pick out bird songs on its own and approximate an arrival date. In both cases, the computer’s estimates closely matched what human observers had noted in the field. Their unsupervised machine learning method could potentially be extended to any dataset of animal vocalizations. Though relatively simple, these tools could speed up the analysis of acoustic datasets packed with biodiversity information valuable to conservationists and others, says Andrew Farnsworth, a researcher at the Cornell Lab of Ornithology who was not involved in the study. Songbirds are notoriously difficult to track in the wild. Their migrations span thousands of miles and their bodies are too small to tag with GPS receivers. 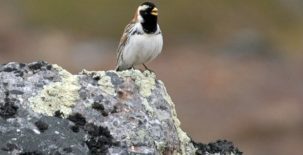 In a novel approach, Natalie Boelman, an ecologist at Columbia’s Lamont-Doherty Earth Observatory, and her colleagues set out microphones in the foothills of Alaska’s Brooks Range to eavesdrop on two particular species that fly in each spring to mate and raise their young: white-crowned sparrows and Lapland longspurs. Starting in 2010, the team recorded for five seasons at regular intervals from early May through July. They hoped to pin down when the birds were arriving and if the species mix would shift as plants favoring warmer temperatures expand their range. 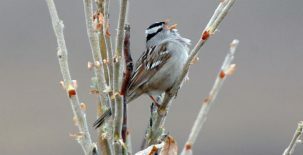 White-crowned sparrows prefer woody shrubs, and Lapland longspurs, open grasslands. With shrubs expected to dominate the area by 2050, sparrows could end up pushing out longspurs and other tundra-adapted birds. In the next phase of their research, the team hopes to develop the tool further to distinguish between sparrows and longspurs, among other species, to spot population-level trends. Species-specific identification is a complex problem that other researchers are trying to crack. At Cornell, Farnsworth and his colleagues are using deep learning tools in a project called BirdVox to classify recordings of migratory bird calls at night, when there’s less competing noise to filter out. Wildlife Acoustics, a company near Boston, is building low-cost field recorders and developing software to track the comings and goings of birds, as well as frogs, bats, and whales, by the sounds they make. The longer the data set, the greater chance that a climate change signal will pop out. For Boelman, five years proved too short in a region known for big year-to-year swings in weather and temperature, which appear to be growing more extreme with climate change. In a recent study in Oecologia based on observational data, the team reported that both sparrows and longspurs appeared to time their arrival and breeding to local conditions; when a late spring delayed snowmelt by 10 days in 2013, the birds arrived 3 to 6 days later than usual, and hatched their young 4 to 10 days later. Study: Eavesdropping on the Arctic: Automated bioacoustics reveal dynamics in songbird breeding phenology. Other authors are Dan Ellis, Columbia Engineering; Helen Chmura, Jesse Krause, Jonathan Pereze and John Wingfield, University of California at Davis; Shannan Sweet, Cornell University; and Laura Gough, Towson University. 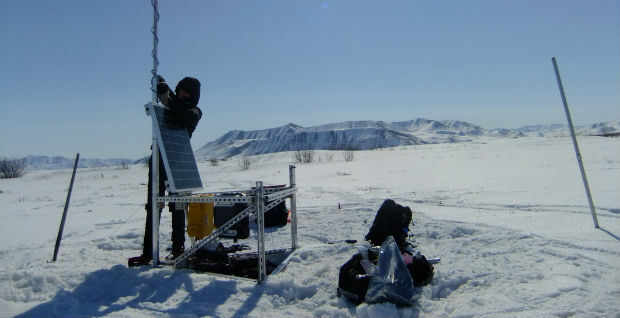 The study was funded by the National Science Foundation’s Office of Polar Programs and Graduate Research Fellow Programs; a $200,000 grant from Columbia’s Data Science Institute; and NASA’s Arctic-Boreal Vulnerability Experiment.